The Scarborough Education Foundation is a nonprofit corporation organized under the laws of the State of Maine that operates in the Town of Scarborough, Maine. The Foundation was established in December, 2011. 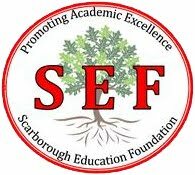 The mission of the Scarborough Education Foundation is to promote academic excellence in the Scarborough public schools by providing funding for innovative and creative educational programs that fall outside of traditional school budget considerations.